When smarts and determination come together you have Mary Beth Storjohann. Mary Beth started working at just 15 years old and as her journey unfolded she saw a huge hole in a population that was not being served. She later became a Certified Financial Planner and has accomplished so much no only in her career but with the population she serves. She’s very savvy and talks money in a simple, enjoyable way! I know you will not only get a lot of this episode but enjoy it as well. Be in the know when enrollment opens for the the Fearless Money Sisterhood monthly membership program! JOIN THE WAITLIST. What resonated with you most about this episode? Please be sure to let me know in the comments below! 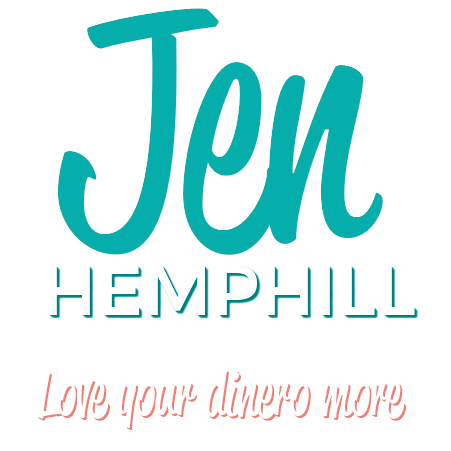 [00:00:26.2] JH: Hello there, this is Jen Hemphill. I am excited to have you here. It is another glorious and sunny day over here at the Her Money Matters Podcast headquarters. I have to tell you that there were about three weeks that we had pretty much consecutive rain but definitely consecutive gloom. So when the sun is out, I am just enjoying the day even though I think we’re going to have more rain in the next day or so but I’ve got to enjoy what we have, right? Now today I have another fabulous guest for you that I am excited to bring to you but before I do that, I want to remind you that even though the Fearless Money Sisterhood membership enrolment is closed, that is pretty much around the corner. Time flies, and before you know it, July will be here. So make sure that you get yourself on the wait list to be notified when it opens at Jenhemphill.com/fearless. Those that are on that wait list are going to get notifications. There’s a lot of fun stuff going on before the enrolment so be sure to join that but of course, join it not just for the incentives and the fun stuff that’s going to go on but because you’re truly interested in the program. So let’s share about what we’re going to learn in today’s episode. We’re going to learn about why our guest started working when she was 15 years old and didn’t look back and we’re going to learn how she broke the rules in the financial services industry and proved the field wrong. It is a good, juicy story there, then we’re also going to learn what her take is on how much of a money cushion you should have when you retire, which is such a common question and how to choose the best financial vehicle for your long term’s savings strategy. So let me tell you a little bit about Mary Beth Storjohann. Mary Beth is a CFP and is the founder of Workable Wealth and works as an author, speaker and financial coach. With over 12 years of experience in the financial services industry, she applies a fun, nonsense approach in working with individuals and couples in their 20’s through 40’s across the country, helping them make smart, educated choices with their money. Mary Beth makes frequent appearances on NBC as a financial expert and has been featured in major media outlets such as US News and World Report, the Wall Street Journal, Glamour, Women’s Health, Yahoo Finance, and Forbes. Her first book, Work Your Wealth: Nine Steps to Making some Smarter Choices with Your Money, cuts through all the fancy lingo, breaks down complicated topics and provides clear cut guidance on the money moves that you can make to improve your financial situation right now. So let’s go and talk with Mary Beth. 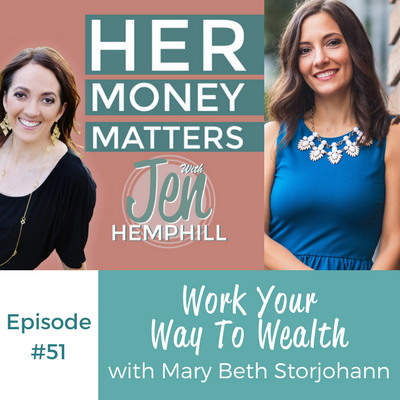 [00:03:46.2] JH: Welcome Mary Beth to the Her Money Matters Podcast. I’m excited to have you here. [00:03:51.1] MS: Thanks so much for having me. I’m excited to be here. [00:03:53.8] JH: It’s my pleasure. I wanted to start off with just getting to know you better and then after that because you are a certified financial planner and this is a show about money, I have some questions for you as well, is that good? [00:04:08.2] MS: Yep, sounds good. [00:04:09.2] JH: Perfect, so tell us a little bit about how you grew up around money, your money story. [00:04:14.8] MS: My money story is a little complicated. My family struggled financially as I was growing up. My parents were super hard workers. They always worked to provide for my sisters and I but they just didn’t have the financial education that was necessary to get things on track. I am full Italian so I always say there are lots of loud discussions about money in our household growing up. My parents unfortunately, I remember them claiming bankruptcy twice. They almost lost our house at one point in time and I have those visions from my childhood remembering what was going on. So that was the experience I had around money and again, my dad would work multiple jobs just to put food on the table and to provide for us. So it was always this disconnect of money was always very scarce and you have to work very hard to get what you need to get by and I got my first job at the age of 15 and I’ve worked ever since and when it came time to pay for college, that’s how I ended up in the industry basically was that I got a job in the financial planning industry as a receptionist on my sophomore year. So yeah, that was my experience growing up. I just witnessed a lot of the anxiety and stress that money could cause, a lot of those fights, and working through high school and working through college, I carried a lot of the anxiety with me. I really felt that there would never be enough just because that’s how I grew up. Even being in the industry and when I got the job in the financial planning industry in my sophomore year of college, I started out as a receptionist and I began to see these clients come into these financial planning firm who also had stress and anxiety around their money and they had questions that were unanswered. It was there and I began to see that there’s this whole profession dedicated around creating a plan with your money and that you can actually control it instead of it controlling you. That switched something inside of me and I switched my major and I majored in financial services, I majored in money in college and I have been in the industry now for 13 years and even through that time though, through my 20’s, it took a lot of work and a lot of self-reflection and understanding my money story, how that has actually contributed to who I am today but that’s where my background came from. And now, from working with people who are mostly in their 50’s and 60’s and helping them retire, which was really educational for the first 10 years of my career, for me it always came back to wanting to help middle market America, wanting to help my generation, those 20’s, 30’s, 40’s and so that’s how I launched Workable Wealth because I always felt there was such a big need and some underserved market and our generation deserves this education as much as anybody so that’s kind of how all the pieces fell together of my money story. But I did, I grew up with that stress and anxiety and I parlayed it now to this profession of helping and empowering others. [00:07:03.1] JH: That is awesome. Thanks for sharing that, and what would you say you do well with money? Of course you’ve got all these expertise under your belt and education but what would you say is what you do best with money? [00:07:16.4] MS: Personally or in working with others? [00:07:20.2] MS: Personally, what I do best with money is, I mean the best thing I do is create a plan for it. I track it, everything has a target dollar amount associated to it in terms of goals and I direct it towards where it needs to go. So tracking the money is probably the best thing that I do with it. [00:07:37.5] JH: So do you use a spreadsheet, a software program,, or what do you do to track that? [00:07:44.3] MS: I’m pretty old school in terms of tracking money. I use an excel spreadsheet just like a check registry. So I literary like to know what’s in my checking account down to the penny and then there’s Mint.com as well to help us see where the money is going but for me, the way that I typically work is, as long as I know what my savings goals are and I am saving the amount that I want to put towards those goals and I’m on track for those, I am not necessarily going to dig in to see, “What am I spending on dining out each month? That’s not what works for me as long as I know I’m on track, I feel comfortable with what I have left over to spend, if that makes sense. [00:08:20.6] JH: Yes, that makes sense and I like that you bring that point because sometimes we stress so much especially when we’re trying to get our finances in order, we stress so much about where that money is going because we do need to know that especially in the beginning if you don’t know what’s going on but I like the point that you bring that, well, if you’re goals are on target, you are not going to stress yourself where everything is going every single month because you have already a system setup. [00:08:51.1] JH: I love that, and since — with your background and what you do, are you the money manager in your home or is your husband the one that mainly manages the personal finances? [00:09:02.1] MS: So this is what’s interesting. So up until — we just had our first daughter last year, our first child. [00:09:08.5] MS: Thank you. So up until last year, I handled a lot of it. I did the tracking, the paying the bills, I handled everything and then with the launch of Workable Wealth, running the business, getting pregnant and doing other things, one of the things that my husband and I decided on was we did two things. Actually now, he takes over the bills and we sit down together though every two weeks to go through, to figure out what do we do, are we on track for savings or for travel or personal stuff, all of these things. And so actually does the bills but we sit down together to talk through spending if anything is out of line and then we actually, last year when I got pregnant, we hired our own financial planner. So that was one of the biggest things for me was, even being the financial planner, I thought that was a lot of stress because it does fall on you as a financial planner to make all of the decisions and it’s still a marriage though and I want his input. I don’t want to necessarily fell the need just because it’s my job. So having a financial planner for us has probably been one of the most beneficial things for our financial relationship and our financial goals as well because it gave me that peace of mind like, “Yes, we’re on track, we don’t need to do it all today,” and it gave him a third party to talk things through it as well. So we have our own financial planner now and then he pays the bills and then we handle things together on a biweekly basis. [00:10:26.0] JH: Okay, perfect and I like what you said that you, as a financial planner, hired one and that says a lot because I think you also need just the outside perspective. Even though you have all this knowledge, sometimes in trying to do — with the knowledge, with life at home, sometimes you oversee some things that an outside perspective can share with you. So I think that’s great that you did that, and then when you manage your finances at home, do you have a certain system that you use that works best? I know some people do the cash envelop system, I personally have different accounts for different purposes, is there something that you use that has worked really well with you? [00:11:10.4] MS: In terms of managing finances, that’s the biggest thing for us and I am also big on a team method. Even if one person is paying the bills, we both are involved in the process. What’s worked for us is we also have multiple accounts for different savings goals. So we have a travel savings account that we put money into it on a monthly basis for our vacations. Even though our insurance premiums are due every six months, we actually break those down into monthly payments and transfer money into those accounts each month so we don’t have to pull a big amount out of cash flow. We have multiple savings accounts for different things like emergency funds and capped out but different goals, basically we have the multiple accounts savings account method. So that’s one of the ways that worked for us and I really liked that way because I always know that all of the bills are taken care of whether they occur monthly, annually or semi-annually. That’s something that has worked for us, and then what we do is we divide our bills into two categories. So it’s not necessarily software but we’ve divided our bills into two categories. Even though he gets paid by weekly and then being my own business, I pay myself monthly basically. So we divide bills into two categories, either the 1st or the 15th and then we target each pay period what bills need to get paid for them. So we have a calendar of what’s going to come out of what checks. We just rotate through them so it actually really helped us to keep track of what we can save each pay period and what we have left over each pay period and that’s worked well for us. [00:12:38.2] JH: Awesome, thanks for sharing that because I love that we do pretty much similar as an account for a travel. I separate the quarterly bills that come due, transfer money every month because that’s just, for us, it’s made life so much easier because once the bill comes due, “Okay let me grab that money out of that account,” and you’re done. So that has worked beautifully for us as well so I love hearing that you use that as well. And would you consider yourself a saver or a spender? [00:13:12.4] JH: And how about your best money memory? [00:13:15.2] MS: My best money memory, I’d say I have two different money memory, two best. One is basically when I saved enough money to go to Europe after college. That’s probably one of my best splurges for myself that I was able to work towards and I’d say just last year in my business, it was the best year of my business so far and that was really exciting for me and really empowering to know that I’m building a business, helping people to take control of their finances. So I don’t necessarily think that there is one point, but just like when you are starting something out and you were told, I started because I was told that I couldn’t work with this generation and it wouldn’t work as a viable business and knowing that it is actually a viable business and I am succeeding, I think there’s no better feeling than that for me. Even when it’s the hard entrepreneur nowadays, knowing that I have clients people appreciate me and how this business has grown, that’s the best feeling ever. So it’s not a memory per se, but it’s a feeling that I like to tap into every now and then. [00:14:20.2] JH: Right and that’s crazy that you’ve been told that that specific niche wasn’t a viable business model. That is crazy to me, just because you’re really actually just starting earlier is what you’re doing. So that’s crazy to hear that you were told that. That is crazy, it blows my mind. [00:14:40.4] MS: Really, so yeah it’s a whole another side topic but it’s very interesting. That’s why a lot of people who are getting into the side of things on the financial planning industry, like I said it’s a very ignored market in the industry because we’re not pre-retirees, they don’t have their millions of dollars yet and we’re not trying to sell them a product. We’re just doing financial coaching and financial advice and a lot of the older financial planners basically think it’s not a viable business model and because you’re not charging somebody an investment fee for the money they have that you can’t make it work when people are proving them wrong now. [00:15:16.6] JH: Absolutely and how about your proudest money moment? I know you mentioned your trip to Europe and last year in business but do you have a proudest money moment? [00:15:28.2] MS: Proudest money moment, I would say honestly one of the biggest things is buying our house. My husband owned the condo before I moved in and then we bought our house recently and just being able to sign on the line, have the down payment ready, all of that. I think that is one, knowing that we have our finances in order that we can do these things and we have saved and worked for that, I am so proud of that. I’m proud of where we’ve gotten because we worked hard to get where we are. So I think that’s one of my proudest moments. [00:16:02.0] JH: Absolutely, that’s a big feat because buying a house is not an easy thing. It’s a long process. [00:16:12.2] JH: Yes, just to have the down payment, to have everything ready to buy a house, that’s a big thing so definitely something worth to celebrate about. So I want to hear about you as you’re a certified financial planner and I want to get some insights from you. So what do you think when someone thinks of long term planning and retirement and I know we don’t know how long how we’re going to be on this and there’s a lot of different variables but how do you determine a good retirement cushion and what that looks like? [00:16:50.3] MS: So I can’t remember who published the number right now but there’s an article floating around in the past month or so that basically says that “millennials new retirement number, they need $1.8 million in a cushion for retirement.” I can’t remember who published the study right now but I just looked at the article yesterday. So that is a new number that is floating out there and ultimately though, for my husband and I for example, we are targeting and I always tell him that, “We need $5 million in the bank to be able to retire,” which is ridiculous and so one of the things that I would say is you have to consider your lifestyle. So when it does and we don’t know how long we’re going to be on this earth but in terms of retirement, it’s really had. I get asked this question a lot and I’m sure you talk about it a lot as well. So in terms of a retirement, what your retirement looks like and what my retirement looks like will be completely different because it is going to be based off of our goals and I think that’s where people struggle especially if you’re in your 20’s, 30’s or early 40’s, you are thinking like, “Gosh, this is 20 years into the future, or 30 years into the future. Why do I care?” But if you think about it, you yourself is the kind of person who during retirement you want to be able to travel to Europe, you want to be able to golf, you want to be able to travel abroad to volunteer or whatever, if you want to spend your time on more expensive activities and more expensive hobbies. Well that retirement picture is going to look so different than somebody who says, “You know what? I am really comfortable staying locally. I just want to spend time with my kids and grandkids, do some volunteer work, and that sort of thing, mostly stay home and stay locally.” That’s going to be a different kind of retirement funding than the next person. So I think that’s the biggest thing is when you do start, when you think about what kind of retirement you want like if you are okay thinking like, “Hey, I’m just going to stay close to home and stay in the community and I am not going to require a lot of money,” well, then you probably don’t need to stash away as much as the person who does. But it is also a consideration of if you’re buying a house and you’re 35 for example and let’s say you’ve got a 30 year fixed mortgage, if you are planning to retire before 65, that’s means you’re going to go into your retirement years with debt, with the mortgage payment. Is that something that you want to pay off ahead of time? So there is so many questions around it that it’s hard to say what to do but some of the things that I recommend in my book as an example would be, start with the 4% rule. The 4% rule in the financial planning industry basically says that you can safely withdraw 4% of your savings and your investments each year to live off of. So if you had a $1 million for example that you saved up $1 million, you can safely withdraw 4% a year without really running out of money. So that would be $40,000 a year. So you have to ask yourself, “Could that $40,000 a year support me?” And that’s where it comes to knowing the numbers and $40,000 a year there and then if you’re lucky enough to have, we’re talking about the military, if you’re lucky enough to have a pension, maybe that will supplement as well and then social security that I say if we’re young count on half with that amount because we don’t know where it’s going to go. There will be something but maybe don’t count the whole thing and then crunch the numbers from there. So if you can’t live off with that $40,000 a year, well maybe you need to save $2 million. So that’s where I start with the numbers of this is what you need to stash aside but ultimately, if we’re taking about younger generation, I try not to start with, “You need to have $2 million saved.” I try to start with, “What can you do?” I say, “Aim for 10% if you’re in your 20’s of your income and then aim for 15% in your 30’s, more so if you’re in your 40’s. Just keep bumping up the amount in your stash in a way and that’s a place to start,” because if you focus on that number, I can’t even get people to save $20,000 into an emergency fund let alone telling them that they need $2 million, that’s just crazy. [00:20:40.3] JH: Right, I hear you and those are some great tips and I am glad that you brought that up because recently I did an episode on because one thing that people just stress, “Oh my gosh, I’ll never going to have enough for retirement,” but I mentioned that we’ve got to look and think about what that retirement is going to look like for you and you mention that as well, so the lifestyles. So before getting overwhelmed and stressed, get clear as to what you want and how you want to live. I loved that you mentioned that and some great tips with the 4% rule and how much you should save, what percentage you should save and what age bracket so that was good stuff. Let’s talk about the different options for retirement. We have the traditional Roth, the Roth IRA, of course you’re employer to sponsored plan or if you are an entrepreneur, we have other options as well. So how do you choose what’s best for you? In the Roth IRA is post tax dollars and I have to think about it to make sure I don’t say it backwards and then employment sponsor plans are pre-tax dollars. So thinking of in terms of repercussions down the line tax wise, how do you determine what’s best for you? Do you pick a combination of the both between Roth and 401(k)? Tell us a little bit about that, in your thoughts. [00:22:05.7] MS: So that’s where it can get complicated and depending on the clients. So there is, I think you said Roth. So there is a traditional IRA and there’s a Roth IRA. So a traditional IRA is basically pre-tax money, so you don’t pay taxes today but you do pay taxes later on when you do take the money out. A Roth IRA is post-tax, so you pay taxes today but that allows the money to grow over that time period and then all the money comes to you tax free later on. That’s what you do on your own. You have those options and again, if you don’t have any sponsor plan through your employer, the IRA and the Roth IRA are always options. The Roth IRA though, again if you’re doing that, and the IRA in certain circumstances you can actually phase out of those based off of the income that you make. Something to keep in mind is if you earn too much money, you might not qualify to contribute to a Roth IRA. Those are things to keep in mind with your planning. I have come across a few clients who have been contributing and they’re not supposed to be so that can affect you but then the employer-sponsored plans, your 401(k), a lot of employers now actually offer a traditional 401(k) and they also offer the Roth version, which again, you either don’t pay taxes today and you do pay them later or you pay them today and you don’t pay them later. A lot of employers now offer that traditional 401(k) or the Roth 401(k) option or if you’re a teacher and you have a 403(b) or the military, you have a TSP government stuff. The thing to keep in mind with those is first, if your employer offered any kind of match, if you get 50% up to 6% or whatever it is, always contribute enough to your employer sponsor plan to take advantage of the match. That is free money. So if I can say anything like take advantage of any free money that anybody wants to give you all the time. Before you even worry about tax benefits, do that because that’s extra money coming to you. From there, one of the things is when we’re younger, the Roth makes the most sense because we’re assuming your income is going to go up overtime and your tax rate are going to go up overtime. There are certain breakeven amounts depending if you are earning huge amounts of income right now, it might make sense to actually do the traditional IRA or the traditional 401(k) because your tax rates are so high right now, you want to reduce those and your income will likely be lowered during retirement because you’re sustaining a different kind of lifestyle. So those are different things to consider but if you’re income is in the middle of the road right now, you expected it to go out overtime and we do expect tax rates to increase overtime then a Roth makes the most option right now. Either a Roth 401(k) or a Roth IRA however if you’re earning a high income bracket right now, then an IRA or a traditional 401(k), taking advantage of the tax deduction immediately, could be a better option as well and there’s lots of calculators online that can allow you to do a breakeven analysis on that. If you want to get really detailed in the numbers for any of the listeners. [00:25:07.3] MS: No, absolutely. It is interesting. [00:25:09.9] JH: Right and you gave some really good info as well and on last week’s episode, we had Melissa Koide from the US Treasury. She shared about the myRA program. So I am wondering what your thoughts are on that program in terms of adding it to the mix of what you’re already doing. If you already have let’s say a Roth IRA or are contributing to your employer-sponsored 401(k), tell us your thoughts on that? [00:25:41.0] MS: Yeah. Honestly I think it’s an amazing program for those who don’t have access to do anything else, but I do think that the best thing that you can do is take the reins on your own and open your own IRA, a Roth IRA and you would probably be able to do like the same $5,500 because you don’t have to worry about investments, you just get a guaranteed interest rate. The interest rate is not going up so it would be sustainable for the long run. So while it’s good or something to fit in as part of a plan, I would say ultimately max out your Roth or traditional IRA, take advantage of your full 401(k) if you have that, which is $18,000 for the year or $18,500, I always forget. Either way put the max in there and if you have above and beyond, then you want to go to an after tax savings account but chances are, if you had a myRA or doing it on your own, I would rather you do it on your own. Open your own account and start to learn. Because by doing the myRA, I think it’s a great idea but ultimately, you are kicking the can down the road on taking the reins of your own financial future because you are choosing not to do the research of where to open your accounts, choosing not to understand where your investments should be and what it should be earning. For me, I don’t necessarily think that’s — I don’t know, I feel like that’s a BandAid but it’s not. It’s only a solution to a problem for a bit, the financial education piece. [00:27:04.8] JH: Got it, I like that perspective. That’s why I wanted to ask you because I did see it definitely like a good starter program, just a no-brainer way to just start up if you haven’t even done anything. So I loved hearing your thoughts on that. Now, I want to know about your book. Tell us a little bit about your book. I’m definitely going to include a link in the show notes for this but how it all started, why you wanted to write the book and what the book is about? [00:27:34.2] MS: Sure, so the book is called Work Your Wealth: Nine Steps to Making Smarter Choices with Your Money and the book came about from — I launched Workable Wealth in 2013. I work with clients all over the country and specifically targeted millennials initially and now, my clients are late 20’s to early 40’s so there’s that, you know if we talk generations it’s Gen Y and Gen X. People in my industry talk about it, but people are like, “I am just 30 something, what does that mean?” So the way it started though by working with the younger generation, obviously some people are just starting out on their financial journey and so basically, I have been working with clients all across the country, my calendar is open to have consultations with clients all across the country. So I was getting a lot of phone calls from people who needed help or just needed the initial education, who had questions in terms of paying down student loan debt or how to set up a budget for the first time and so that’s where the idea for this came from. I have always enjoyed writing and blogging is a big part of what I do at Workable Wealth anyways. So throughout the hundreds of conversations that I have had throughout the podcast, interviews I have been on and the interviews that I have done with the media, a lot of the same topics and questions were coming up for this generation and one of the things that I do is that I really enjoyed working with women. My website doesn’t specifically target them but if you go to website, it’s very female oriented. So it’s different to be in an industry to be a toppy hen and talk down to somebody. I think there’s a lot of that already and I really appreciate like the Dave Ramsey’s like those — I appreciate what they do but I don’t think it’s a lot of friendly like, “Hey, I’ve been here. Here is what I have done, here’s what you should do. I am not any better than you, I am a friend, I’m an accountability partner.” So that’s where the idea of the book came. It really came from being, I wanted to be encouraging, and I wanted it to be a peer to peer and I am a friend next to you, and I wanted it to be educational and empowering. I didn’t want it to be a 250 page finance book that made it hard to handle. It’s a pretty thin book, it’s a quick read but each chapter gives money moves in terms of how to actually set goals that matter to you and I think that’s the biggest thing. Going back to retirement and that scary number, the biggest thing on why we should start knowing where our money is going, a lot of people just don’t actually understand what they value and they don’t really have clear cut goals for themselves. Like, “I want to travel with my family because these experiences will last a lifetime and I want them to see the freedom, to see the world,” a lot of people don’t take time to set those goals for themselves and really spell out why things are important to them and that’s why people don’t want to know where their money is going because they don’t want to just cut back to cut back, you need to be invested in something. So the book starts with that and then it goes into how to pay down your debt, how to set up a budget, it talks about all the retirement stuff that we just spoke about, it teaches about investments and really again, it’s meant and geared towards learning how to safe. If you’re looking for fancy investment strategies or retirement planning tools, that’s not going to fill you in. It’s a basic jump starter like curios to get in control of your finances, let’s make it fun. I talk about diversification which is an icky, scary word sometimes but I compare it to shoes like the types of shoes that we own and so I really try to make it easy to follow and friendly. That’s what it’s about, it’s breaking it down and bringing it back to the basics so that you have that education and empowerment. You’ll feel in control of your money instead of having it be scary because I think that’s where the industry makes it scary. You have this vision of older gentlemen behind mahogany desks when you think of money and financial planning and it doesn’t have to be that anymore. [00:31:36.9] JH: …image of who a financial planner is, what the stereotype is, so that is exciting. Well, this has been fabulous Mary Beth. 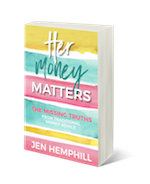 You’ve shared so much good stuff, so many nuggets, so many great tips, I really appreciate that and the last thing that I want to ask you is just how you would finish this sentence: Her Money Matters because _____. [00:32:03.0] MS: Her Money Matters because the more you have your head in the game, the more likely you are to actually achieve your financial goals. [00:32:10.5] JH: Perfect. So again, it’s been such a pleasure having you on the show. I really appreciate your time and I’m hoping to connect with you soon. [00:32:18.0] MS: Definitely, thanks so much for having me. [00:32:21.5] JH: So what did you think about Mary Beth? She was super fun, right? And then she’s very smart and just a beautiful person inside and out. So I hope that you enjoyed learning from her as much as I enjoyed talking with her. I do want to share one quick takeaway with you from the chat with Mary Beth, but before I do that, as usual I’d like to give a shout out and I am so glad that I get such great feedback on the shout out. So I am glad that you are loving it because I love doing these. Today’s shout out goes to Julie. She is one of the members in the Fearless Money Sisterhood Membership Program and she recently paid off, get this, $10,000 Euros in debt. So congratulations! One thing about Julie is she is committed, she is consistent, and she’s not worried about taking those big steps. She’s only focused on those steps that she’s ready to make. So congratulations, again Julie. You’ve done great, you’ve accomplished so much, and can’t wait to see what else you accomplish in the next several months. So let’s talk about, quickly, the chat with Mary Beth. There were something that really struck a chord with me and that was the advice that she gave on how to determine what is a good cushion for you and she mentioned how you determine that is to look at your goals and your lifestyle and I love that she said that. It definitely aligns to what I talk to in episode 48. So if you haven’t checked out episode 48, definitely do that. And I think it’s important to consider this just because we get so bogged down with the actual numbers, trying to figure out the numbers that we over complicate it and we get ourselves overwhelmed just in trying to determine that number by all these different factors where really, all you need to consider and think about is, like she mentioned, your goals, your lifestyle. So I really, really love that. So that is it for today. I want to remind you about the waitlist for the Fearless Money Sisterhood. So get on that if you haven’t done so already and you can do that at Jenhemphill.com/fearless. The other thing that I want to share with you is that next week is June and in June, we are going to be diving into relationships and money. So we’re going to talk all about that. I’ve got some great guests lined up for June and I’ve got a very, very special guest that I’m excited to introduce to you to. He will be our very first male on the podcast so I am excited about that. So thank you so much for joining me today. I want to thank Mary Beth for joining us, for sharing so much of value. It was a lot of fun, a lot of great nuggets in there. So be sure to check out the show notes on where to find Mary Beth and all the different links that we’ve discussed on the episode at Jenhemphill.com/51. So thanks again for joining me and I will talk to you again next Thursday. P.S. THANK YOU for listening!Enjoy The Show?